Featuring MIKA and L'Orchestra Sinfonica, Conducted by Simon Leclerc. Distributed by Eagle Rock Entertainment. 93 minutes. Not Rated. In the United States, there is a tendency of music fans to close our minds when they hear that a rock or pop star is doing a performance with a symphony orchestra. We have the tendency to shake our heads and think: oh no, that is going to be seriously pretentious. Prog rock is so thirty-forty years ago. In Europe, this natural reaction does not really translate. In fact many of the biggest names in pop and rock take the orchestral gamble, one that sometimes pays off. MIKA (n� Michael Holbrook Penniman, Jr.) is a superstar act in his native Europe (well, he was born in Beirut, but moved as a baby and grew up in Paris and London). He has something of a following in the US as well. All four of his albums have been released in the States to some success (particularly Life in Cartoon Motion and The Boy Who Knew Too Much), but he has never quite broken through to stardom on this side of the pond like he finds at home. Not surprisingly, my first exposure to him was through one of our writers with European roots. Her mother was French and the family had a summer house in the Riviera through her childhood, and she still traveled their semi-regularly to see family. While on a trip to France she discovered MIKA's music and thought we should do a feature on him. The interview never ended up happening, but at the time I did pick up his first two CDs and came to respect his craft as a singer and songwriter. So much of life is just by chance. This show, filmed in a spectacular Gothic venue � Teatro Sociale in Como, Italy � also happened just by chance, in many ways. 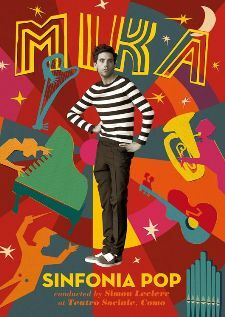 In an interview in the extras of this show, MIKA explains that he had never considered anything like this when a friend of his suggested that he should try performing with The Montreal Symphony Orchestra (Orchestre symphonique de Montr�al). MIKA thought she was kidding and laughed it off: "I should be doing lots of things." When the idea of the shows first came up, Leclerc had only one hard and fast rule. They were not going to just do busy orchestral recordings of his pop hits. They were going to reinvent the songs, performing them acoustically only and liberally changing the tempos and structures of the songs. MIKA admits it was hard, draining work, but it also somehow works extremely well, as it gives the show a more complete, ambient feel. Dipping into his songbook from all four of his albums, Sinfonia Pop is a brave and mostly successful job of rethinking a musical legacy. Instead of a bunch of songs strung together with little rhyme or reason, it almost feels like a conceptual whole. Therefore, for example, "Boum Boum Boum" feels a bit like a gypsy show tune, while "Last Party" becomes a tragic showstopper. The orchestration for "Love You When I'm Drunk" adds a little gravity to the whimsically goofy song, and it makes "Ordinary Man" feel like a 60s lounge favorite. Overall, the concert takes on the feel of a one-man musical show. For MIKA, this was a very worthy experiment. Copyright �2016 PopEntertainment.com. All rights reserved. Posted: June 30, 2016.